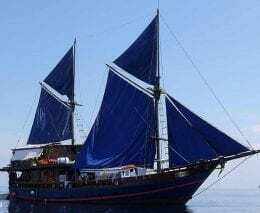 The Moana is perfectly equipped for cruising, snorkelling and diving and runs regular 6 and 8-day itineraries exclusively through the Komodo National park. 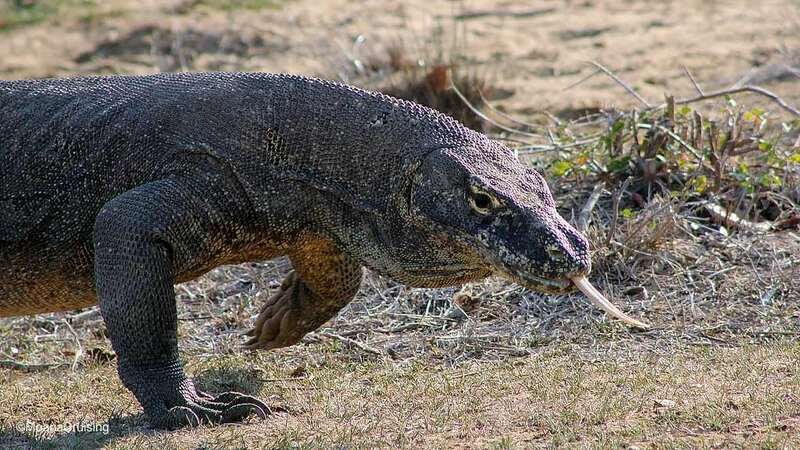 Trips depart Labuan Bajo / Flores weekly and as well as visiting some of the best spots in the NP, include trips to various islands including Komodo to see the Komodo Dragons in their native environment. 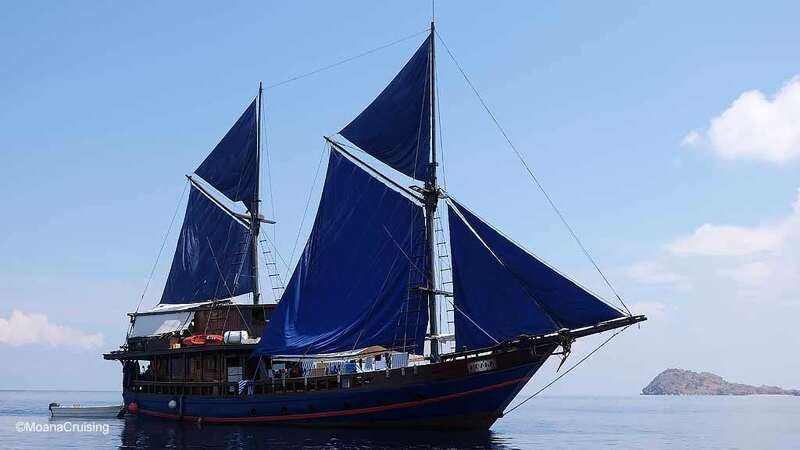 Moana is a classic 30m Phinisi Schooner built in a traditional style but equipped with all the comforts of a new boat. 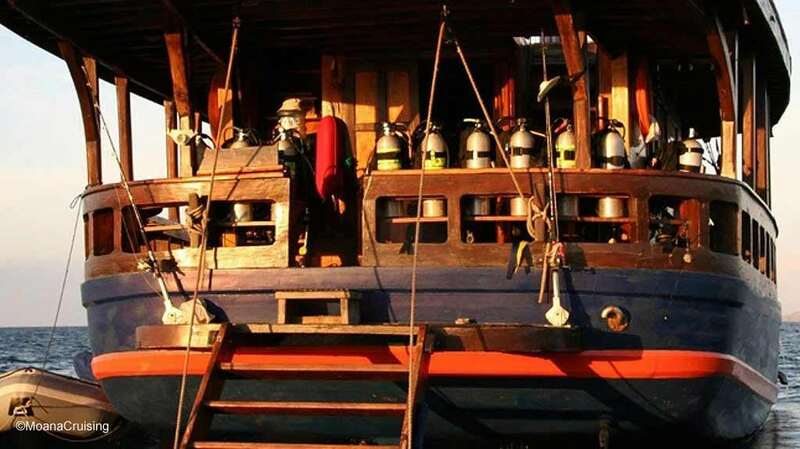 She is entirely made from teak and ironwood, which lends a warm and comfortable air to the boat. Out on deck, there is a large, spacious community dining table, but also spaces for individuals to relax between dives. There is also an indoor air-conditioned salon complete with a library of marine biology books. 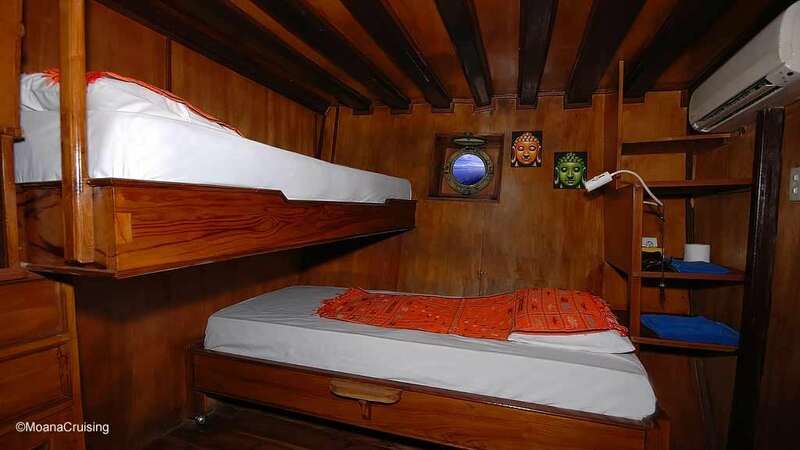 There are 5 cabins below deck, with up to 14 beds, though passenger numbers are limited to 12 max, and divers to 10. All cabins have private en-suite bathrooms and individually controlled air-con. Guests may also sleep on deck under the stars if they choose. 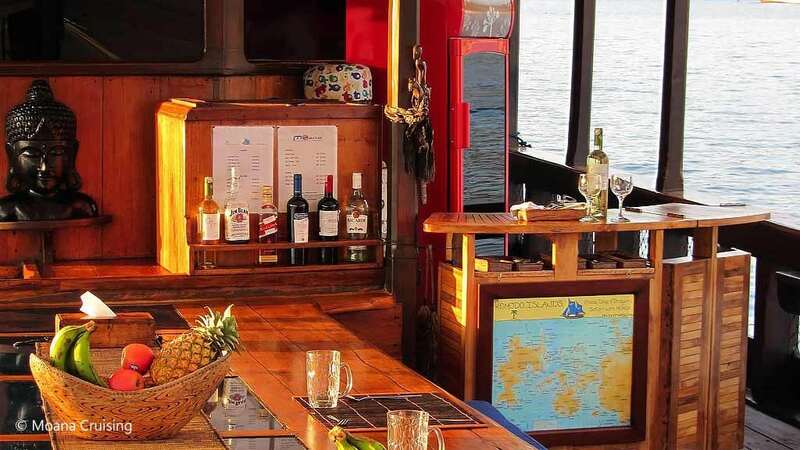 The Moana crew includes the Captain, Mechanic, Cook, Deckhands, Waiter, Dive guide, and Cruise Director, so there is always someone around to ensure your experience aboard is top class. 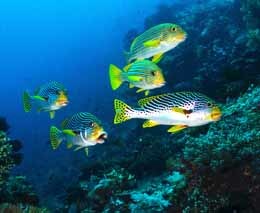 On the full days on the ocean, there are four days per day: early riser, morning, afternoon and night dive. There are two speedboat tenders to take divers to and collect from the dive sites if necessary. 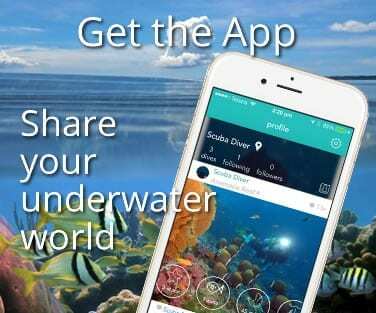 All dives are guided by a PADI certified divemaster or instructor. Four square meals per day and snacks and non-alcoholic drinks are included. Breakfast, lunch and dinner vary daily and includes Indonesian and International specialties – the mix of Asian and Western food cater for all desires. Lunch and dinner include three courses in generous portions. Vegetarian meals or special diets can be accommodated with plenty of advance notice. 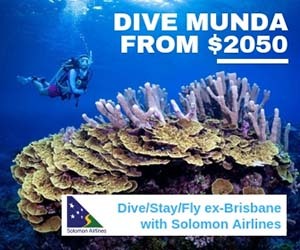 Other activities aboard include the use of kayaks, wake-boarding, the rocket-ride and as much complimentary snorkelling as conditions allow. 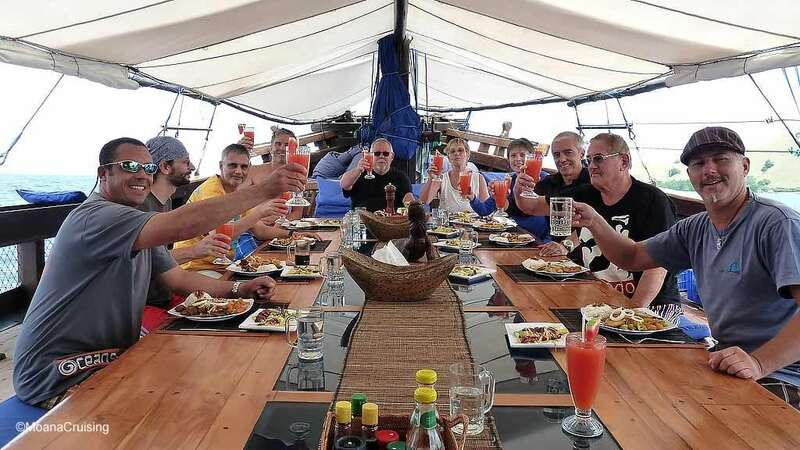 The itineraries range from 5 to 8 days, and there is also the possibility of a sole use charter in which case you can build your own itinerary with the assistance of the captain, cruise director and dive instructor. 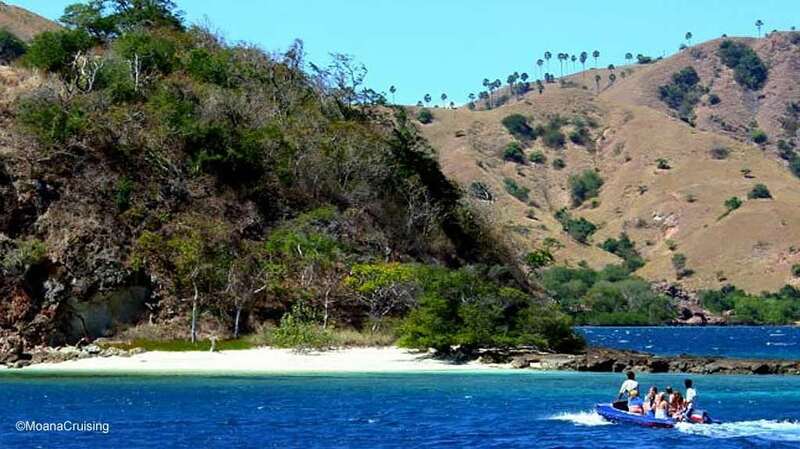 Most itineraries are round trips from Labuan Bajo, and Moana can organise the internal flights between Bali (Denpasar) and Labuan Bajo airport. Airport transfers at both ends of the trip are included. 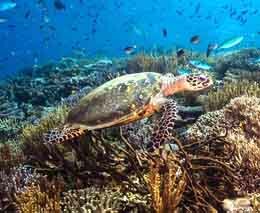 All itineraries include a trip to Komodo/Rinca Island to see the Komodo Dragons – the largest living lizards – in the Komodo National Park. You can check their schedules and pricing at the bottom of the page. 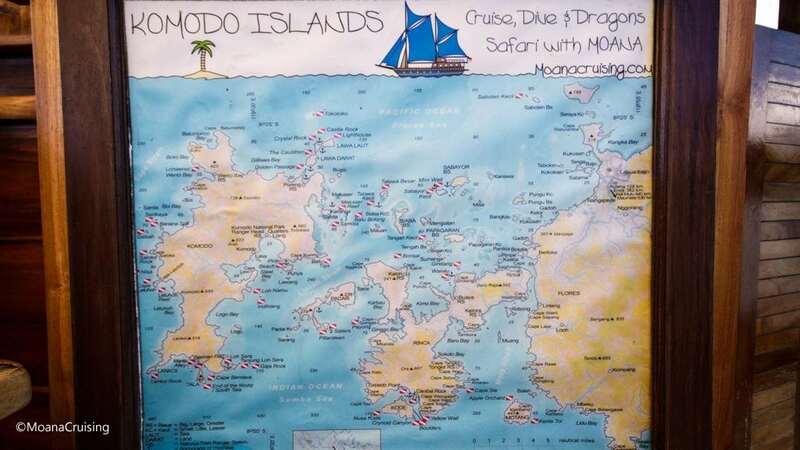 Moana’s itineraries start and end at Labuan Bajo, East Nusa Tenggara, Indonesia. 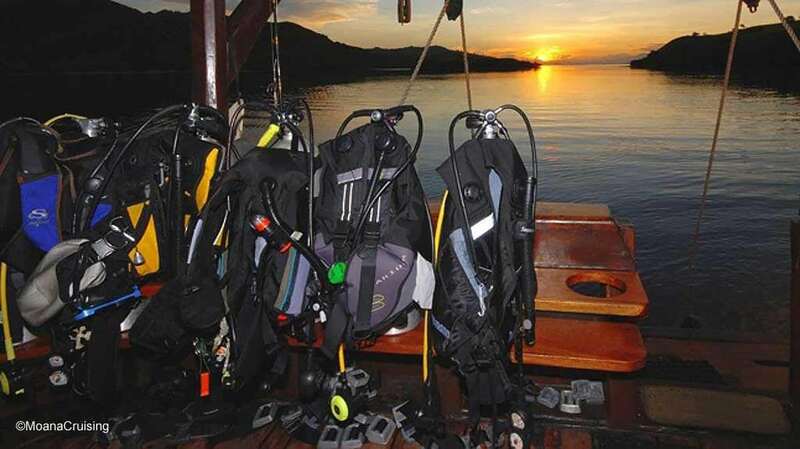 The diving takes place from the dive deck at the rear of the boat. All the gear is stowed there and the 12 litre aluminium tanks are re-filled in situ. Ocean entry and exit are straightforward from the boat’s stairway. Also, both genders are used as required. Moana’s crew of ocean elves takes care of everything from equipment set-up to wash it down at the end of the day. Your day on-board starts with a light and healthy breakfast of fresh seasonal fruits, cornflakes, oats and local honey around 6 am, followed by the first dive of the day. Around 8am, after the first dive, the “real breakfast” is served, varying daily but including omelettes, pancakes, breakfast sausages, ham and bacon as well as fresh bread and toast. Buffet style – all you can eat! During this time, Moana will motor quietly to the next dive site. Preparations start for the morning dive at around 11am. 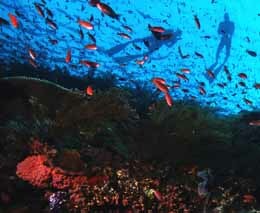 There are no time limits to the dives, so guests are free to maximise their enjoyment. 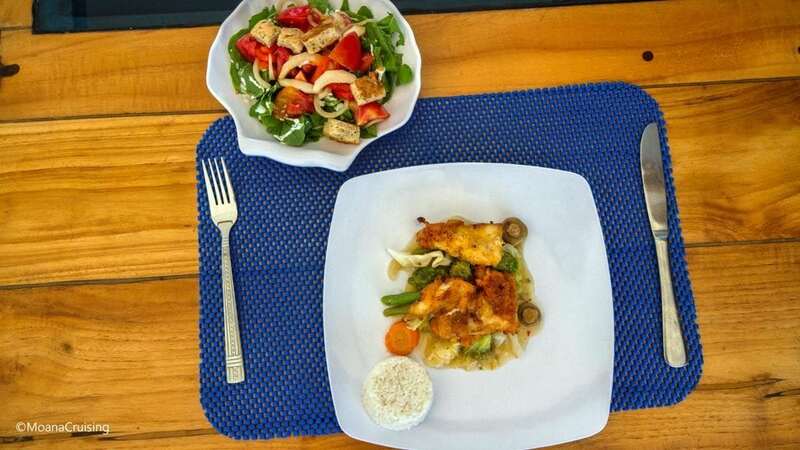 A leisurely lunch is served after the morning dive, and after this there might be a trip ashore to visit the National Park, or a hike up a local hillside to enjoy the stunning view across the peaks and bays. 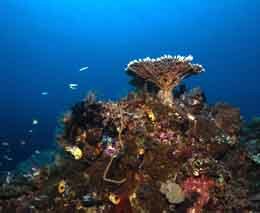 We then start the afternoon dive, usually 2 pm. 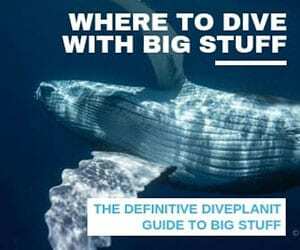 Around 4pm it’s time for ‘High Tea’ or ‘Kaffee und Kuchen’ where Indonesian snacks such as baked pineapples or fried bananas are served, to keep your dive-energy levels topped up. 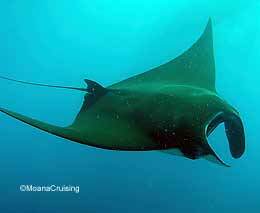 The night dive is shortly after dusk, after which guests can take a hot shower on deck and freshen up for dinner, and the lively banter and sharing of stories that always follows a perfect day’s diving in a tropical paradise.